The next day the 29th Good Friday, 1918, and many a time my thoughts ran home and to different parts of NZ. What could they be doing out there? We had a very quiet time sitting under a little bit of cover all day with only a few shells flying around and I was not sorry when night came so that we could move around a bit and dig to keep warm, which kept me occupied most of the night. 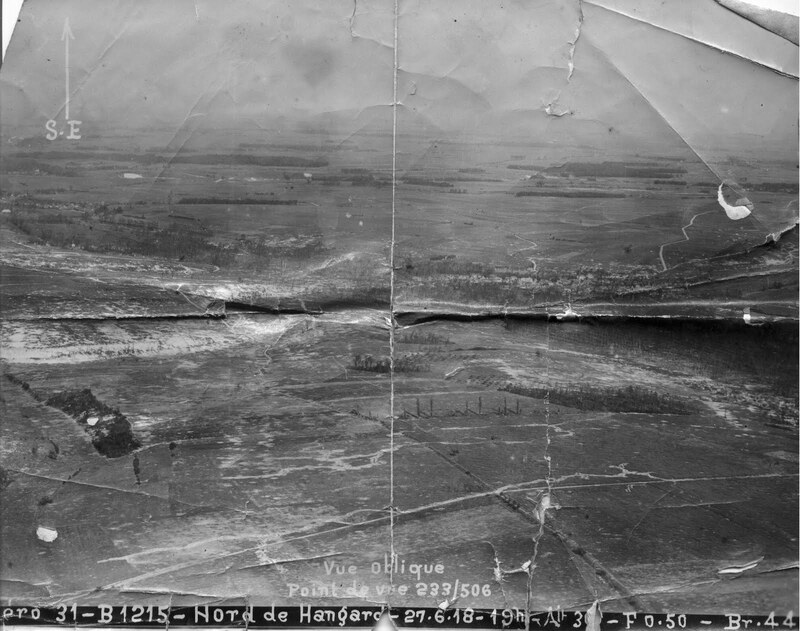 At daylight we got under cover again and all was quiet once more and was so until 1-pm when our Sargent came up the trench and broke the gentle news that Ruahines were going over the top and we were to support them and the barrage would start at 2-pm. My heart began to beat a little faster as I started to wonder what was before me but managed to keep myself amused with putting my gear together, cleaning ammunition and giving the old rifle a final touch. This all finished I asked my mate how the time was going – twenty past one. I thought about four hours had passed by, instead of twenty minutes and was in hope that peace had been declared and our little stint was a washout. Finally, we were asked if we were ready and shortly after away went the guns, some sound, and machine guns rattled everywhere. We all got down into the bottom of the trench and waited and strange to say the only thing that troubled me was cramp in the foot. Here we stayed for some hours and nothing turned up. Then the guns seemed to ease off and I had a bit of a look around to see what was going on. A runner went past and told us the boys had got their objective and were digging in and then once more I breathed freely. Soon we saw prisoners of war coming past. I began to think war was not so very bad after all. Then we got orders to move up to the next line of trenches and very soon I found myself running across about 100 yards of open ground with a shovel in one hand and my rifle in the other gasping for breath and was not sorry when I saw the others jump into a trench and quickly followed. But somehow that was not the finish as they kept going and this time we had about six inches of mud to contend with and every few yards I managed to get tangled up in some wire in the trench and all the time my mates were getting further ahead. Next we passed a dead German and I gave him a very thoughtful glance as I went by. Close behind him was one of our boys who had been shot in the head. I should think he had had a very close call to leave this world. At last I got a chance to catch up with the rest who were all held up at a railway line and had to crawl through a small ditch to get to the other side without being sniped, as there were now plenty of those little bits of lead and shell flying about. My turn came and I managed to get stuck half way and was well smothered in mud by the time I had dragged myself through. On the other side of this we got into a trench with some small bivvies dug in it and after a bit of a look around I planted myself well into one of these to try and keep a bit dry as I then discovered it was raining and I was getting pretty wet. My next experience was to learn what a strafe was. For the next hour or so the ground around me simply trembled. Mud was flying everywhere and one piece landed fair in my ribs as though I was having a few rounds with the gloves on. A piece of shell just missed my foot and at the time I was rather sorry it did. One of the boys on my next was evidently more frightened than I was and came crawling along to the Corp. but I don’t know what for unless it was to stop a blast which he got. During my sojourn in this little spot I had plenty of time and my thoughts travelled in all directions, but once again I was not extra frightened perhaps because I did not realise the extent of the danger I was in. Our boys were getting blown out of their bivvies all along the trench yet no one was hit. Then came the next little scene in the great play and perhaps the star act. What was happening I did not know but simply sat listening to the shells and bullets flying about. After a while the Sargent came along and told us we had to go up to the line and help the Ruahines and very soon we were filing off down a very muddy SAP. I was near the last with our Corporal just behind me who kept telling me to hurry whenever I got tangled up in some wire and I had a big job to keep going. What with excitement and want of breath I was feeling a bit queer. Exactly what I saw during the next half hour is rather hazy to me but I know we had not gone far when I nearly walked on to a dead German lying face up staring at us as we passed. Then the next one was one of our boys and at the sight of him my heart sank. I did not look at the next one who was lying on a stretcher and had evidently been abandoned by his rescuers and from then on things grew worse. Blood was lying in deep pools. In the SAP, men too were lying every few yards and in all positions. Some dead, others just breathing or groaning their last while others were too far-gone even to make a noise and were just quivering as the last of their strength flowed away. At last we came to the end of this trench and had to wait to find out where to go next and then I felt very queer, sick at the sights I had seen. We stopped here a few hours and found that our boys had been held up for some two hours on a strong point, but luckily the Huns had given in just before we arrived on the scene. Less than twenty NZ’s rounded up some sixty prisoners and eight machine guns, so it was little wonder we had been held up. was not long in getting to work on my little piece and can safely say that I worked harder than I ever did before, not even stopping for a drink, although I had a mouth as dry as chips. After a while I was getting well down in the earth and had a nice little bank between Fritz and myself, which made one feel a little safer. The night passed by very quietly, very few shots being fired. At midnight we stopped for a meal, piece of bully, Anzac wafer and some water and then came a spoonful of rum, which nearly got down my throat. All this time a wounded Fritz lying out in front of us had been calling for “mercy Comrade” and finally he was taken away to the hospital very much to his relief and mine too. About 2-am we found another wounded Hun in a posy just behind us who had evidently been lying low. He was also sent away on a stretcher but don’t know how far he got. By dawn our part of the trench was finished and we had a couple of posy’s dug for ourselves and of course daylight prevented us from doing any more digging as no one was looking for any excitement. Up until dinnertime everything was fairly quiet and each of us made use of our bivvies and we tried to get a little sleep but was not very successful. In the afternoon the Heads got the wind up and we were standing too most of the time as some airman reported that he had seen Fritz preparing to counterattack and this even went as far as an order being sent along that he was coming, which I might say put the wind up me. But luckily it was only a false alarm otherwise this may not have been written as our defenses were very poor and I think it was a case going west or Berlin. Sunday night, my Coy was coming into the front line to relieve the Ruahines and we were told that our section would have to stay on and my hopes went very low as I was expecting to go back with the rest. 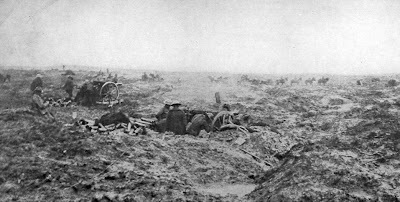 However, there was still a doubt and when the Heads came in, our Corporal went to find out and I anxiously waited his verdict and was excited as though I was to get a trip home and when he put his head over the top of the trench and said to get out, I nearly jumped up and kissed him. 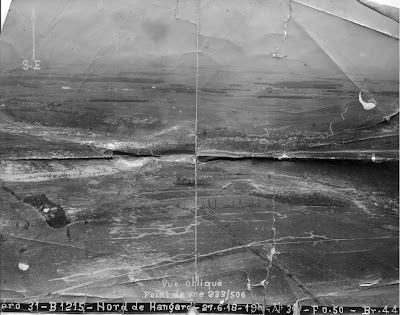 Aerial Photo of the Somme Battlefield. We were soon changing over and got up to the top of the trench and were just moving off when a nice little strafe from Fritz. There was very soon a scatter for an old trench in which we had to wait for a while before making a dash for the next trench across the open country which we did without wasting any time. There we landed in a SAP and waded off through the mud and I was only a bit tired when we reached the supports. Here we got into some old bivvies for a sleep but a good heavy frost and no coats soon settled that argument so I again spent most of the night digging to keep warm. previous Easter Mondays, the last one in particular. In the evening I had to go up to the front line with ammunition but did not get any excitement. Tuesday, the next day we slept most of the time and had to go out for water again and very nearly struck a shell, missing it only by a few yards. That night we were being relieved and were all ready to go when we got orders to supply a burying party. The job not being a very pleasant one and rather risky, the Corporal decided to “Sell a horse” instead of detailing two of us and strange to say this is the first time I have ever won a little lottery but I sat low and thought a lot as this was one of the little duties I did not fancy. As soon as it was dusk we moved up to Supports and after a bit of a spell our Sargent asked for the party and with him we crawled over the top and soon found the body, an Auckland Lance Corporal. The Sargent got his discs and papers etc., and then we placed him in a shell hole. F.M.O. started our task and I am sorry to say it was a very rough burial but the fact that old Fritz kept playing his machine gun on us made it impossible to spend too much time over the job and I was not sorry when my mate said “that is good enough, go for your life”. I put the chaps steel hat at the head of his grave and was very soon back in the trench again breathing a little more freely. We had to wait in the trench for a good while and then set off back as soon as our relief arrived. A cross-country trip soon brought us into Mailly Mallet and we pulled up at a small wood just behind the village and got into some old bivvies already there. We found a hot meal waiting for us, the first we had had for ten days, and I reckoned that stew was the best food I’d ever had. Needless to say we slept in the next morning. After a while we got breakfast and then had a good wash up, shave, etc., and spent the rest of the day resting. Towards evening the boys found a cellar of wine and left it severely alone (I don’t think) and were all feeling good enough for anything that came their way. A few shells were the only excitement we had that day and one or two came a bit close but no damage was done. April 4th we moved off again to a new Camp. This time we were out in the open paddocks under canvas shelters but had plenty of straw, as there were a few haystacks close by. The next day there was a bit of a parade. As we were on the side of the hill facing Fritz I guess he must of got his optics on to us, for a few minutes after the parade he winged a couple of shells into our Camp killing one man and wounding three. We were not very long in getting out of that spot. Every man grabbed his gear and made off over the hill but another shell dropped amongst us stopping another man who was only a few yards in front of me, but landed between us and I was luck enough to be behind it. We fixed up another Camp that night and dug out an old trench in case he repeated his dose. The next couple of days we were working on the road between Courcelles and Bertrancourt and I landed some mail from home, which was more than decent and we were getting plenty of mud and rain while here and the stay was not too pleasant. Monday the 8th April, 1918. We got orders to go up the line. So we got a bath and clean clothes just to keep the stock down. Just before dark we moved off and had a good way to go and after a while it started to rain just to make things a bit more pleasant. We passed through Mailly, which we hardly knew as the same village. It was now a complete heap of wreckage, hardly a house that had not been hit and there was a lot of our guns firing from there. Soon after we got through the village we struck some machine-gun fire and from there, until we got to the front trench, were dodging along between the bursts of fire and flares that were going up every few minutes. We were put into a very crook trench and in places it was hardly eighteen inches deep. We had a big front and old Fritz was very close to us, a fact that did not please me very much. But the night proved a fairly quiet one as did the next day. The following night we took over some more trench which was even worse than the last one and this time my section was placed at the head of a gap running across no mans land, which old Fritz used to come into during the night so it was not a pleasant spot. In the morning we got a good strafe, which put a few of our boys out, but we had a fairly quiet time, so it was not so bad. The next night we fixed up our trench and bivvies. Our guns kept up a solid fire all night. While on sentry just at daylight, I sighted a big Fritz patrol just in front of our trench, which put the wind up me for a while, as I thought he was coming over. I was not long in getting the rest of the boys out and we soon had our Lewis gun talking to them. There was a big scatter and we saw no more of them. Just after daylight I witnesses my first falling plane. One of our Archies got him but he fell in his own lines. We had another quiet day and also night and the following morning I was a bit crook so came out to see the Quack. I had a pretty crook trip. Had to come up a SAP, which had no small amount of mud in it and was well over my knees in most places and a good few dead Fritz did not make things any more pleasant. However, I got to the end of my journey without any excitement. After I got to a good spot, had a long spell and then went in search of the R.A.Q. where I landed a good cup of cocoa and was sent back to the next post pulling up at the Y.M. on the road. I had some more cocoa and biscuits and a good spell. At the next post we got some more cocoa and cake this time and with a few more chaps we were taken back still further to a dressing station and the cocoa act was repeated. From here we were sent per ambulance to the 3rd field ambulance hospital.